Cordless drills are the tools that one requires very frequently around the house. Nowadays nobody really uses the drills that restrict you because they require to be plugged into power points. These days you can always see people investing in cordless equipment, among which the cordless drill is a principal one. When investing in something like a cordless drill, one requires both efficiency and guarantee. Investing in the Bosch DDS181-01 means that you are putting your faith is a company that has been at the lead when it comes to household power tools. One can be assured of getting quality tools from the company and not having to worry about getting the worth for their money. Bosch has been manufacturing quality tools for a long time and they understand what people need for daily household work. Most people these days prefer to do their own household work, instead of paying for an overly expensive worker for daily house jobs. A bit of carpentry, installing a hook for the family portrait, bathroom fittings, etc. are minor jobs which can be done very easily with the Bosch DDS181-01 without hiring any professional. The cordless drill is among equipment every house should have in its tool shed. This is among the few things required quite frequently around the house. So when I needed to buy a cordless drill, I decided to invest in this one by Bosch as they are a reliable brand when tools for the household are concerned. 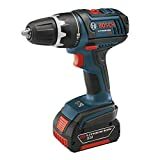 Let me assure you my experience has been a great one with the Bosch DDS181-01 and I recommend it to anyone who wishes to invest in a cordless drill. I shall now give you some details about the equipment that will help you to better understand the drill and check if this is what you need for your house. One of the reasons homes as well as construction companies prefer this drill is because it is easy to use. The drill is 7 inches, the smallest of this kind. But the drill can perform heavy duty jobs despite its size. The build is Durashield housing which ensures that your drill doesn’t crack even if it falls from your hand.it is light and the grip is soft, doesn’t hurt your hands, even when you’re working at it for hours. One of the primary things one looks for in a cordless drill is battery longitivtiy. The Bosch DDS181-01 fulfills that you can drill for an hour with a 30 minute charge if you use the fact pack of 3.0 Ah lithium batteries. There are two more options of the 1.3 Ah slim pack and the 2.6 Ah lithium fat pack. Most drills that are cordless require to be charged for a long time before they can be used and the battery runs out very well. It is extremely annoying to have to charge your drill constantly in between working. The power of this drill will help you to work for a longer time without worrying about charging. One of the main things I look for before buying any expensive equipment is the warranty. Let’s face it; you have to put down quite a lot of money for a cordless drill as compared to a cord drill. I never buy anything that doesn’t come with a satisfactory warranty. The first thing that made me really glad when I bought the Bosch DDS181-01 is the fact that it came with a 30 day money back policy. You can use it and if you don’t find it satisfactory or defective they will give your money back. The product also has a one year warranty which was great. It is always reassuring to know that the company is confident about its product and will change it if need be. You can do almost any type of work with the Bosch DDS181-01. It can be used to work on metal, wood or concrete with equal ease. The drilling power is pretty great and makes sure that you can do all your jobs smoothly and they are durable. The Bosch DDS181-01 was worth every penny; however, there are some things I feel could’ve been better. They should work on the fact that the drill shuts down when it gets overheated. You can experience jams when you are working with the drill, but that is something you have to deal with in a cordless variety. You should definitely have this in your household as it will greatly help you with your projects around the house.